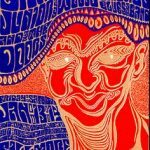 In psychedelic art Wes Wilson’s art helped to define the psychedelic style that defined the era of the 60’s and 70’s. In fact he is generally acknowledged as the father of the 60’s rock concert poster. His poster feature his admiration and respect for the feminine form and are considered to be an enduring representation of the entire period. It is about the recognizable balloon shaped writing with complimentary colors right next to each other in very exciting ways. He wanted a poster that people liked to look at. He wanted to use up all the space on the poster. His art was based on a combination of a whole bunch of things and all based on his idealism that things are going to get better. Wilson’s idealism had him doing posters and fundraising for the “Appeal”and the Merry Prankster Acid Tests were dance hall concerts to benefit anti involvement in the Vietnam War. He was also doing posters for, the Family Dog, Fillmore Auditorium. In May of 1967 he had a dispute with Bill Graham over money and Wilson no longer did posters for Graham. However, he continued to produce posters the Avalon and other venues. Seth and I have had the good fortune of meeting Wes and have a few of his postcards available for our customers. They will not be on the Website and you can call Mom at 856 424 6166. At this time I have 4 of each of these post cards “The Sound” which 8” x 4” and Grateful Dead Fillmore Jan. 1967 5 1/2” x 3 ½” . I also have in my personal collection a copy of his newsletter that was a tribute to Rick Griffin which is not for sale .